On April 22, 2018 there was a 10 player tournament held in Clearwater, Florida at Emerald City Comics with 10 players. The previous tournament we built a Thor deck and I lost every game and the tournament before that I went 2-2 with Groot. I am Groot. This time we re-built the Thor deck and I went 3-1 which ended up making the deck win the tournament on tiebreakers. Every time I go to these tournaments I always have a blast! The four decks I played against were two different Magneto (Brotherhood) decks, Black Bolt and Quake. My first match was with Magneto. I lost the dice roll. The player let me go first which was his demise. I ended up getting the best hand I could possibly get. I had Tim Boo Ba and Scarlet Witch. These two cards helped me get the win. Turn one I got Tim Boo Ba down and the player could not drop any one drops. Turn two I got Scarlet Witch down which then the player never got the chance to level he was able to get XP, but was not given the chance to level. I kept Scarlet Witch and Tim Boo Ba pretty guarded and protected this round. Once Thor got big enough to keep giving Magneto wounds, the game ended quick. This had me in complete surprise. I practiced with my Fiance and I knew this build was soild but it was great to see how powerful Thor could really be in a competitive setting. The next match was a little more challenging. I was matched against Black Bolt. He gave me a run for my money. This match was intense we both were going wound for wound. The biggest highlights from this match were when I made a game ending mistake. We were both on last wounds. I should have moved all my characters to the front to deal the final wound, instead I kept over half my team in the back row so the other player could not drop any one drops and hopefully not be able to get the final wound on Thor. This ended up costing me the game. Black bolt was definitely my biggest challenge this tournament. Then in the third round I had to play more strategically. This match was against Quake. She was able to heal two wounds. This match it was hard to believe that I got Thor up to a 37/37. This made Thor pretty much unstoppable until BAM! *Gorgon*... He literally took away all of the pump the counters were giving. 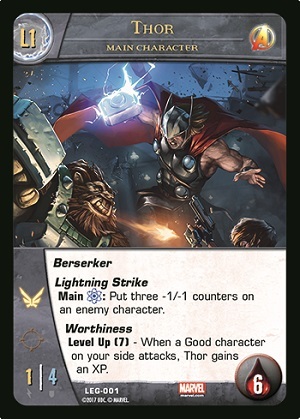 This literally made Thor lose the counters that made Thor a 37/37. Luckily I was able to get those wounds back. A key moment was when I was able to use my Lightning Strike to put 3 -1/-1 counters and double that. Then I attacked for the wound on her with Falcon, because Thor kept getting moved to the back row. I won this game by time. If time would have continued either of us could have won. The last game was against another Magneto deck. This one was rather aggressive and had Toad in it. We were at a point of going wound for wound. I was able to prevent a couple with Think Again. I was able to utilize my Squirrel Girl to get some wounds and she gave me protection until I could level. I did not get Scarlett Witch until late game. So she failed me but Tim Boo Ba was very useful. Turn 8 we both had one wound left to win the game. I drew a Ghost rider and allowed me to give the final wound without attacking for 10 -1/-1 counters, which in turn won the game and won the tournament. What I learned this tournament was to not get too excited when you see your deck doing well for example when I was against Black Bolt, I personally lost focus and then lost the game. Also a person should never under estimate the power of low level characters. Falcon put a wound on a main character. Tim Boo Ba and Scarlet Witch both helped me win rounds. Utilize resource and characters to prevent wounds. Always think one step ahead and save your special cards for when you need them. It is always about having fun at the end of the day. Black bolt may have defeated me in the tournament, but I still enjoyed playing against him. Bonni Barrett is engaged to PauperTim. Don't let her cute looks deceive you, she knows how to play her cards and how to win.